Think creatively when you plan your lighting. What is the effect you want to achieve? Perhaps you have special ornaments or plants you want to highlight. Try using several different lighting techniques to gain an attractive effect, but at the same time, avoid a circus look by using too many lights. Other ideas are to highlight tall trees and use accent lights from low fixtures, with ground lights to mark an entry. Safety is important when designing your outdoor lighting plan. Ensure lights are placed so they do not interfere with lawn mowing, walking or plant growth. Try using several circuits as well, each with its own switch to provide flexibility and variety. This means you can light up separate areas to suit your needs, especially when entertaining. Lighting your entrance and driveway makes your home welcoming and provides a good crime prevention factor. Make sure your garage and outdoor parking areas are well lit for security of people and property. There are many types of switches and sensors available to add to a security lighting scheme. 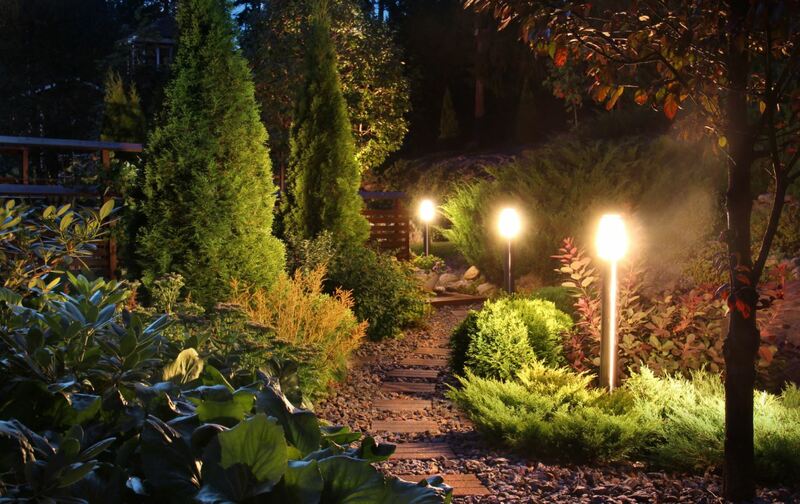 With a well-designed lighting plan, your garden will gain an extra dimension when night falls. It will also add value and attraction to your property.